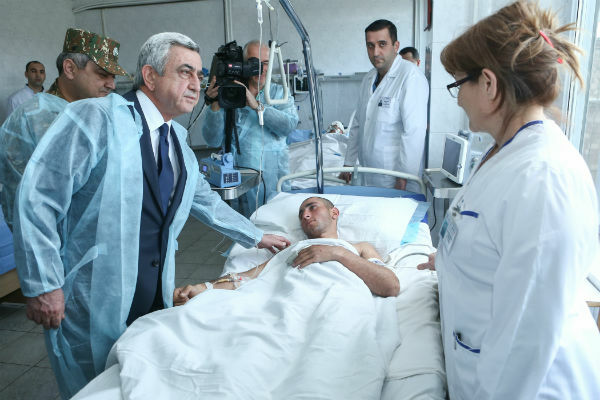 Armenian President Serzh Sargsyan visited wounded soldiers at the central military hospital in Yerevan on April 4. Azerbaijan has made no territorial gains in its latest aggression against Nagorno-Karabakh, according to Armenian President Serzh Sargsyan. Addressing envoys of the Organization for Security and Cooperation in Europe (OSCE) member countries in Yerevan on Monday, the Armenian leader also suggested that Baku has been paying a high price for insignificant ground at two small sections of the frontline. In their earlier statements representatives of military and political authorities in Baku claimed that Azeri forces managed to gain high ground and “liberate” some territories that were earlier under Nagorno-Karabakh’s control. President Ilham Aliyev even declared a “military victory” for Azerbaijan as he addressed the country’s Security Council on April 2. According to the Armenian leader, along the entire perimeter of the line of contact Azerbaijan managed to take only a small section in the south and a small section in the north. “And I hope that until the end of our meeting it will lose this section in the north; the Azeris took control of a territory of only 200-300 meters, leaving more than one victim for every square meter,” Sargsyan emphasized.